And thank you, Thor, for keeping up appearances. 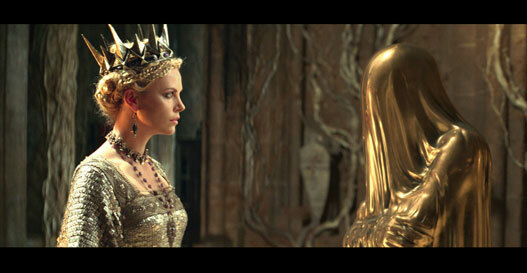 Take a deep breath and say it with me: Snow White And The Huntsman. Doesn’t sound very promising, does it? Like most fantasy films, Snow White And The Huntsman seemed set up for failure. It’s centered around a very popular character portrayed by Bella Swan, the film is based around a fairy tale known universally in every person’s mind, and it seemed tempted to fall for a formula and let down its audience. Believe me, that was the movie I was expecting when I went into the theater. The movie, however, is much better than the title suggests. Based on the famous original fairy tale by brothers Grimm, Snow White And The Huntsmanfollows the story of Snow White (Kirsten Stewart), a kind and beautiful princess of the land Tabor who would one day inherit the kingdom and the throne from her father King Magnus (Noah Huntley). Before she was born, the narrator tells us that her mother pricked her fingers on a rose outside of her castle, with three drops of blood staining the snow. Her mother told herself that she wanted a daughter as white as the snow, lips as red as the blood, and a spirit as strong and defiant as the rose she prickled. This opening sequence was both fascinating and revealing, a deeper introspect into Snow White’s history that I don’t believe has been visited before. Her mother eventually died giving birth to Snow White, and so King Magnus marries a strikingly beautiful woman named Ravenna (Charlize Theron), whom he rescued from a dark army made out of glass soldiers that tried to invade his kingdom. Magnus is so stricken by Ravenna’s beauty, in fact, that she becomes his queen in less than two days. You already know where this is going, don’t you? Ravenna is, in fact, the dark and conniving witch leader of the dark army. After killing Magnus in his bed, she takes Snow White, forces her into the upstairs dungeon, and seizes power over the kingdom as the newly appointed Queen of Tabor. Years past, and the kingdom of Tabor falls into desolation and poverty. Snow White has now become of age to become the new queen of Tabor, and has been blessed with the gift of kindness that will ultimately dethrone Ravenna from the throne. Snow White eventually escapes from the dungeon, flees from Ravenna, and escapes into the dark forest, a place where people slowly lose their sanity and, in time, their life. Raevenna cannot go to this place to kill Snow White, so she hires somebody who can: a huntsman by the name of Eric (Chris Hemsworth), a man who lost his wife to death’s hand long ago. Nothing could convince this angry, tired old drunk to take this job willingly, but he takes the job nonetheless in the hopes of that the evil witch can revive his dead wife with her dark powers. And so the adventures of Snow White and the Huntsman begin. The biggest thing Snow White And The Huntsman has going for it is two things: its visuals and its handling of the premise, in that exact order. Rubert Sanders, who is making his director debut through this picture, is very smart and very careful with his visuals, using very precise and expertly-detailed CGI in things like the Magic Mirror or in the dark army made out of glass. But it isn’t just the visuals that makes the picture what it is: Sanders is smart enough to make the visuals mean something, and just like the camera he’s using to record the picture, the visuals are a tool he uses to tell a story and to instill some deeper meaning in the audience. Take, for example, how Sanders uses the color of white in the picture. The color itself only appears three times in the picture: once where Snow White rides and abandons a white horse on the beach, another time where she encounters and caresses a magnificent and beautiful white stag, and the last one being where she dies and is resurrected while being in a white funeral dress. Go back and look at the pictures again and try to look at it through a more symbolic scope. I promise you, if you see the picture as I do, you will see a princess abandoning her kingdom, returning to her kingdom, and finally, becoming the queen and leader that the kingdom deserves. To find such complexion in a picture as this was both shocking and surprising, and the cast delivers just as much as the visuals do. Charlize Theron was menacing, evil, and conniving as the dark witch, and gives a stellar performance that would have had the animated version relieving in her pants. Stewart, shockingly, is very grounded in her take as Snow White, and embodies everything her mother says she has: strength, beauty, courage, kindness, and heart, and this especially shows in the last half hour of the picture. Hemsworth was equally as emotional and convincing as the huntsman named Eric, although there are a few brief moments where he breaks character and acts more like Thor from The Avengers. There was another Snow White movie released earlier this year called Mirror Mirror, and it starred the lovely Lily Collins and Julia Roberts in roles opposite Stewart and Theron. That movie was too silly and immature for its own good. Here, we have the opposite problem: this film is dreary, dark, sullen, and bleak, a movie that for the first half of its runtime, fills us with dread, angst, and sorrow. Starkly different tone from the whimsical, uplifting veins of the original Disney classic don’t you think? Whatever happened to Doc, Grumpy, Happy, Sleepy, Bashful, Sneezy, and Dopey? Still, its a good movie. When there is color in the picture, it reaches out to you in striking detail, the cast is extremely strong, and the visuals and the camera angles combine to make a very provocative picture and a very sharp visual experience. All you need left is Mjolnir and the rest of the Avengers, and you’ll be all set.